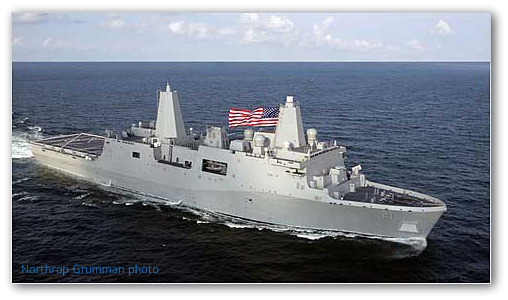 USS New York was built with 24 tons of scrap steel from the World Trade Center. Steel from the World Trade Center was melted down in a foundry in Amite, LA to cast the ship's bow section. 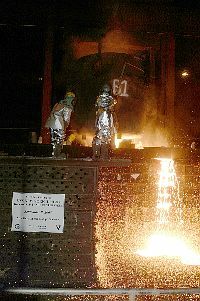 When it was poured into the molds on Sept 9, 2003, "those big rough steelworkers treated it with total reverence," recalled Navy Capt. Kevin Wensing, who was there. "It was a spiritual moment for everybody there." Junior Chavers, foundry operations manager, said that when the trade center steel first arrived, he touched it with his hand and the "hair on my neck stood up." "It had a big meaning to it for all of us," he said. "They knocked us down. They can't keep us down. We're going to be back." "This ship's motto was inspired by President Bush when he said, 'Never forget.' The citizens of America will never forget what happened in New York on September 11 … will never forget the sacrifices of the brave citizens of this city and state --- and the Navy and Marine Corps will never forget. We will not falter and We will not fail.'" Return to top of USS New York. At her christening ceremony, USS New York (LPD-21) is already demonstrating her toughness. USS New York schedule for ship visits while in New York. 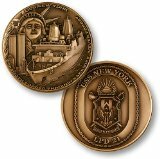 Amid a gala celebration, USS New York arrives in the Big Apple.